23 March 2015: The WATEF network's field trip to Berlin began with the group's arrival at their hotel in Berlin. Once everyone had settled into their rooms we all set off down the tree-lined Kurfurstendamm to locate the City Circle tour company. 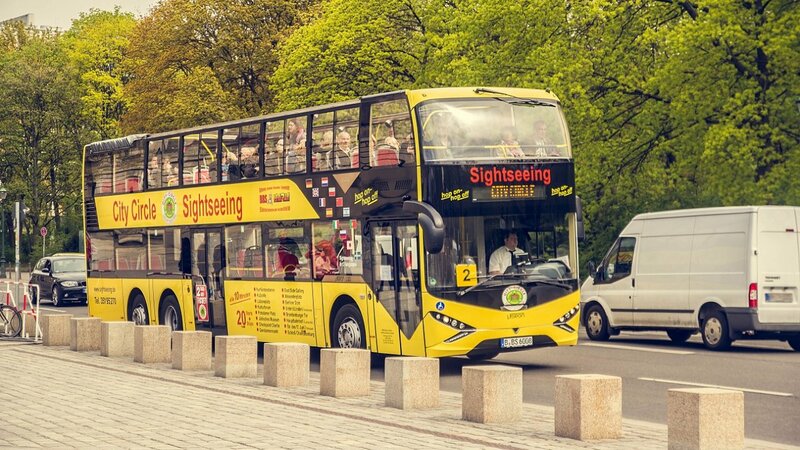 Soon a City Circle sightseeing bus appeared and we all climbed aboard opting for the best view on the upstairs deck. Everyone was provided with a set of headphones and a commentary in English for the duration of the bus tour and off we went. Berlin is an amazing city with an eclectic mix of old and new, each district has its own special brand and everywhere you look building is taking place. After the tour everyone made their way back to the hotel where we all had dinner together and then our hosts, Erwin and Norma Nolde took us to a nearby establishment where we were able to sample some micro brewed beer. Apparently it's quite common in Berlin to find an establishment which brews its own beer and very nice it was too!! 24 March 2015 : The following day began with an early breakfast for everyone and we all met Norma in the hotel lobby around 8.00 am. We took the U-Bahn to our first site visit at Arminplatz where we met with Ing. Erwin Nolde. Die Projekt am Arnimplatz is a joint venture between Nolde & Partners and the building's architect. This housing project has 41 apartments in total built to the Passiv-haus standards. From the innovative outside blinds which keep the apartments cool, greywater recycling systems that supply cheaper water to residents, to the heat recovery system which keeps all the apartments at an ambient temperature.. All of which can be remotely monitored and managed by Nolde & Partners; everything is designed to high environmental standards whilst ensuring that the resident's energy, water and maintenance costs as kept to the barest minimum. We then took the U-Bahn once again to Block 6 where we visited the Roof Water-Farm Project (RWF) in collaboration with the Technical University of Berlin. We were met at the Project by Grit Burgow and some of her students and shown the new hydro and aqua-ponics systems which are used for the cultivation of fish and vegetables. We were also able to walk through the surrounding wetland area which offers environmental benefits, and fascilitates rainwater recycling and attenuation. Ing. Nolde then showed us into the waste water recycling plant where we were able to observe each process taking place. A fish tank full of local small species at the far end of the room demonstrated to us how sustainable the water was after all the processes had taken place. The presentation delivered by Dr Grit buergow of the Technical University of Berlin is available via our Resource one-stop-shop. Our last visit was to the River Spree where we all met with Ing. Ralf Steeg and his team who demonstrated his modular stormwater tanks. The system is housed under water on an "island" of walkways which reach a few metres into the river. It is hoped that similar "islands" can be built along the River Spree, perhaps housing gardens and cafes, to allow Berliners to swim in the waters. We would like to thank our colleagues at Nolde & Partners, The Technical University of Berlin and Herr Ralf Steeg for their kind assistance in making this such an enjoyable visit. We checked out of the hotel by 10.00 am and spent an informative half day visiting the Berlin Messe where the Wasser Berlin exhibition was taking place. We saw many exhibits including the display below showing the latest innovation in UV technology for treating water. It was altogether a successful first study trip organised by the Watef Network. In view of the positive feedback received, we will continue to explore future opportunities to organise similar events. Therefore, we welcome suggestions and invitations from external parties to visit their innovative projects.